In the so-called “linguistics wars” I find myself most impressed by those who, like Michael Halliday, root their linguistics in anthropology and sociology rather than in neural science or genetics. While I am aware that the old parable of the elephant applies, my principal reason for my preference is pragmatic; as a teaching tool and as a means of critique of actual language in use — “critical literacy” for example — that approach to language study is most useful. It provides the best framework for thinking through who says (and sometimes does) what, to whom, when, where, why and how? Who Framed George Lakoff? is one of the weekend offerings on Arts & Letters Daily. Lakoff [right] is within the camp of linguists I find useful, even if he presents as a “brain-based” linguist. From a teaching perspective, I have found the likes of Chomsky and Pinker fairly useless — I speak of the linguistics, in the first instance, not the political commentary. 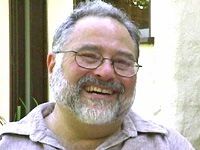 I have occasionally referred to Lakoff before, and his 1995 study Metaphor, Morality, and Politics, Or, Why Conservatives Have Left Liberals In the Dust has long been on my Links Page. …In his new book, Lakoff takes aim at “Enlightenment reason,” the belief that reason is conscious, logical, and unemotional. Harnessing together work from several fields, particularly psychology, neuroscience, and linguistics, he mounts a polemical assault on the notion that people think rationally — which, he argues, is fundamentally at odds with how the brain actually functions. …Lakoff acknowledges that both academic and political cultures are slow to change. But he is optimistic, pointing to the way in which the growth of cognitive psychology has undermined the rational-actor model that long dominated economics. In his own field, Lakoff predicts that “brain-based linguistics” will soon become the new standard — indeed, eclipsing Chomsky. See also George Lakoff on Edge.